This post originally appeared as a guest post on SprinklePop’s blog. 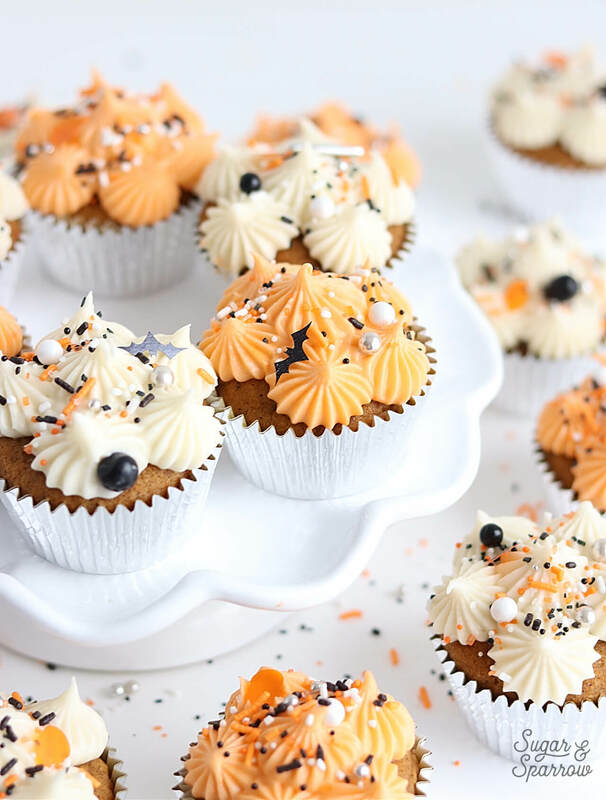 It’s such a classic Fall recipe and fun Halloween party cupcake idea, so I just had to share it here too. Enjoy! It’s officially feeling like Fall around here. Leaves are changing the prettiest colors, the weather’s getting colder, and I just spent the entire weekend wearing cozy sweaters and baking with autumnal flavors! 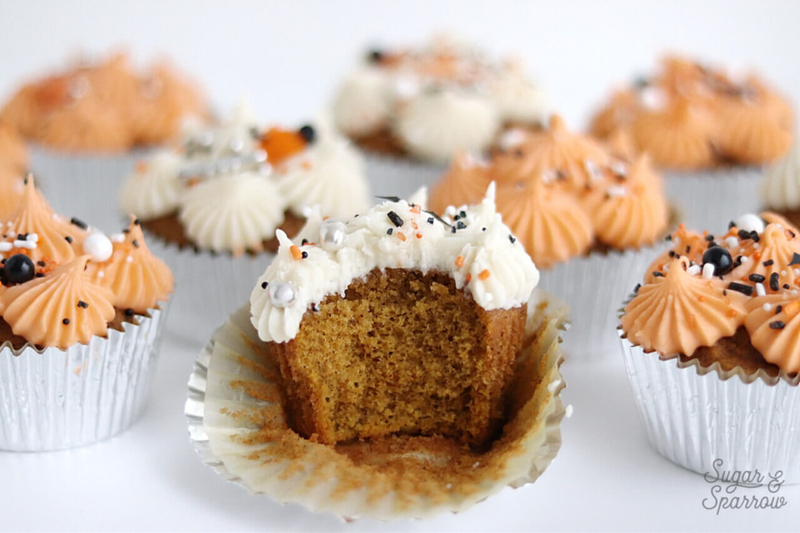 One of my absolute favorite things to bake in the Fall are pumpkin cupcakes with cream cheese frosting. They’re a seasonal classic, downright delicious, and they make the whole house smell incredible while they’re baking. I’ve been known to bake them and hoard them all to myself, but they also make great party cupcakes (that is, if you’re willing to share!). 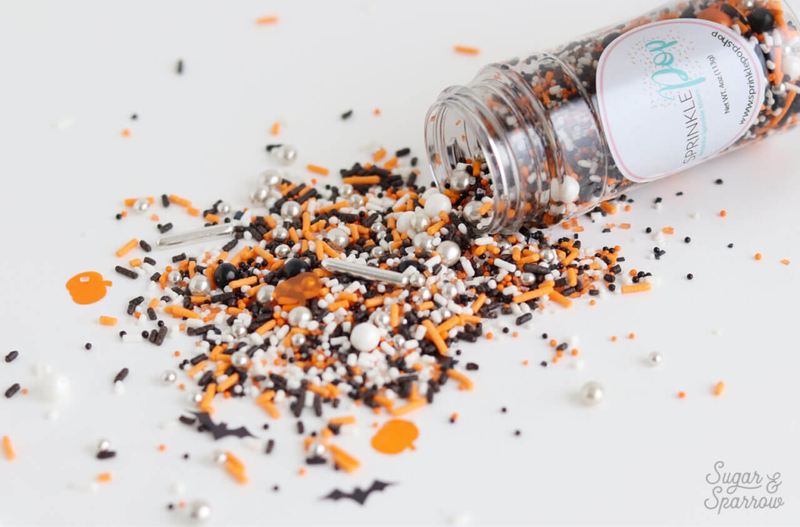 For all the more festive occasions, this All Hallows sprinkle mix by SprinklePop is perfect! Let’s talk about the flavors going on underneath all the pretty sprinkles. 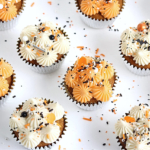 As far as the cupcakes go, the use of pureed pumpkin (be careful not to use pumpkin pie filling!) makes them so moist and melt-in-your-mouth good. The crumb is fluffy and rich without being too dense from all the added moisture, making them a little dangerous because it’s easy to eat more than one! I’ve spiced the batter with cinnamon, ginger, allspice, and nutmeg just to up the cozy factor and really take the flavor of the pumpkin to the next level. And I know I said it before, but these cupcakes will make your kitchen smell like heaven! Cream cheese buttercream is the perfect pairing for pumpkin cupcakes, and while cream cheese frostings tend to be on the soft side, the recipe I use is perfect for piping! It’s decadent and flavorful without being overly sweet, and holds its shape long enough to pipe some pretty designs. I’ve used Wilton Tip 6B to pipe large open stars over the surface of the cupcakes before sprinkling with the All Hallows sprinkle mix. Since I couldn’t decide whether I wanted a white or orange buttercream backdrop for these sprinkles, I went ahead and tinted some of the cream cheese buttercream with orange food color gel. I actually ended up liking both looks, so I paired them together for all these photos! 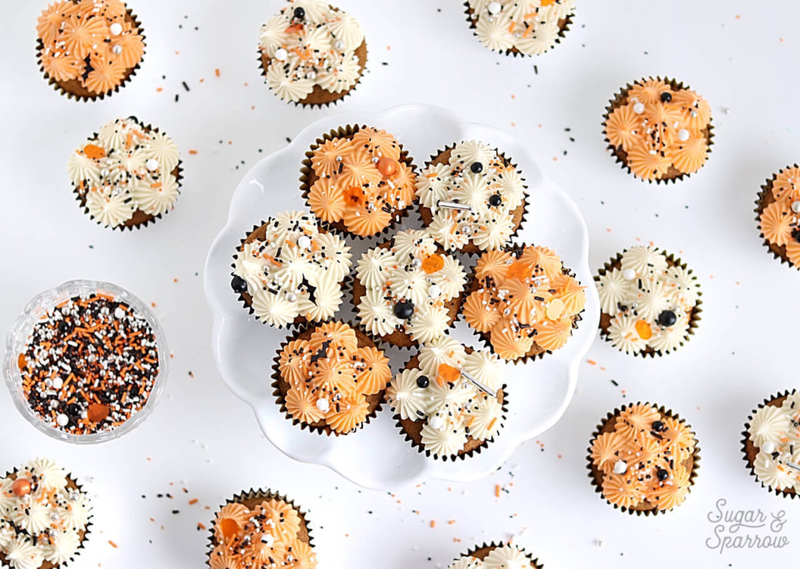 I’m sure that the All Hallows sprinkle mix would look amazing on any spooky buttercream color palette or piping design. 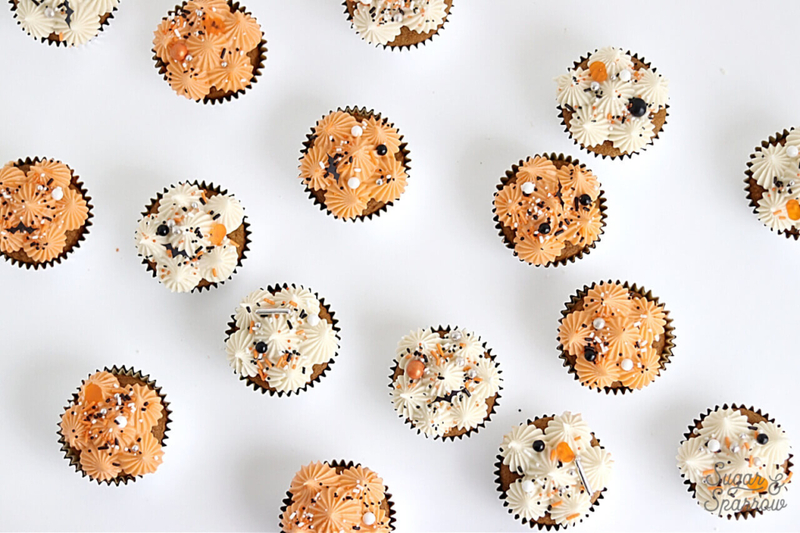 Whatever your Halloween event, these cupcakes will be a sure hit looks-wise and flavor-wise! 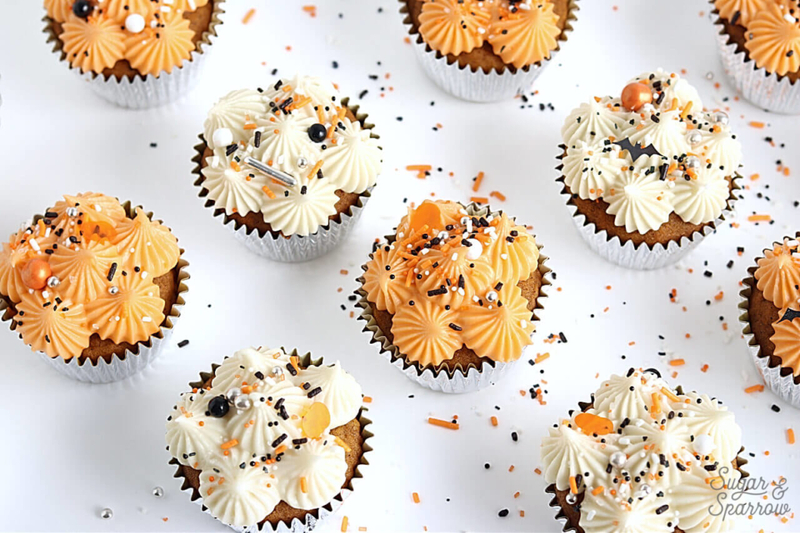 Moist and flavorful spiced pumpkin cupcakes topped with decadent cream cheese buttercream that's the perfect consistency for pretty piping. Preheat the oven to 350ºF and prepare a muffin pan by lining with cupcake tins. *Measure the flour by spooning into your measuring cup and leveling it, then whisk it together with the rest of the dry ingredients and set aside. Cream the butter on high for 1 minute. Add the white and brown sugars and cream on high for another 2 minutes. Add the pumpkin and vanilla and beat for 3 full minutes, scraping down the bowl and paddle once in between. Turn the mixer to low and add the eggs one at a time, mixing thoroughly after each addition. With the mixer still on low, add the dry ingredients until combined. The batter will be thick. Spoon the batter into prepared cupcake tins ⅔ of the way full, then bake for 19 minutes, or until a toothpick inserted comes out clean. Cool the cupcakes in the pan for five minutes before removing and continuing to cool on a wire rack or flat surface. In the bowl of a stand mixer fitted with the paddle attachment, cream the butter and cream cheese on high until light, fluffy, and uniform (no lumps), about five minutes. Turn the mixer to low and add the powdered sugar a few cups at a time, mixing thoroughly after each addition. Add the vanilla and salt, mixing on low for another 30 seconds. After the cupcakes are fully cooled, prepare a piping bag by fitting with Wilton Tip 6B (or other favorite piping tip) and filling the bag with cream cheese buttercream. I’ve chosen to pipe a few open stars over the surface of each cupcake. 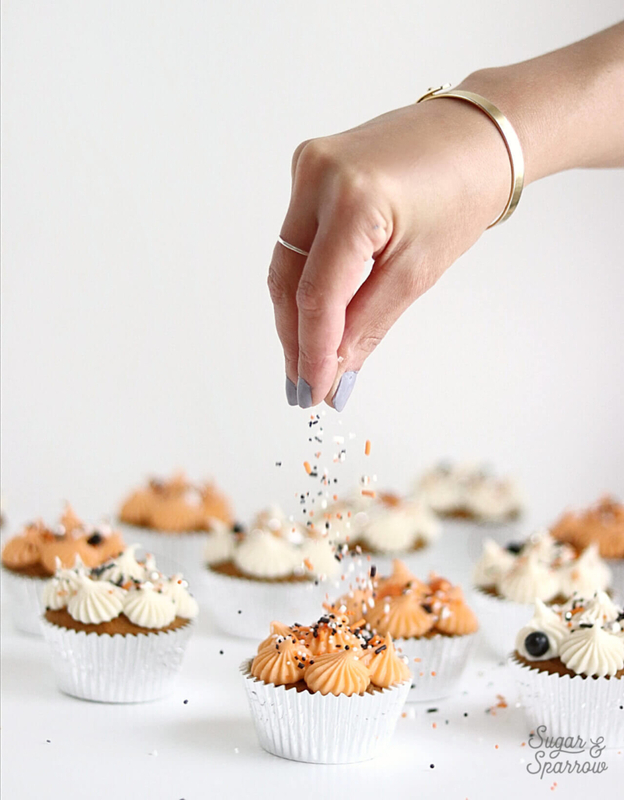 Finish by sprinkling with the All Hallows sprinkle mix. Make Ahead Tips: The cupcakes can be made ahead and stored at room temperature, covered with plastic wrap, for up to two days. The cream cheese buttercream can be made ahead and stored in an airtight container in the refrigerator for up to two weeks. When you're ready to use it, bring it back to room temperature and re-whip with your mixer to bring it back to the right consistency. 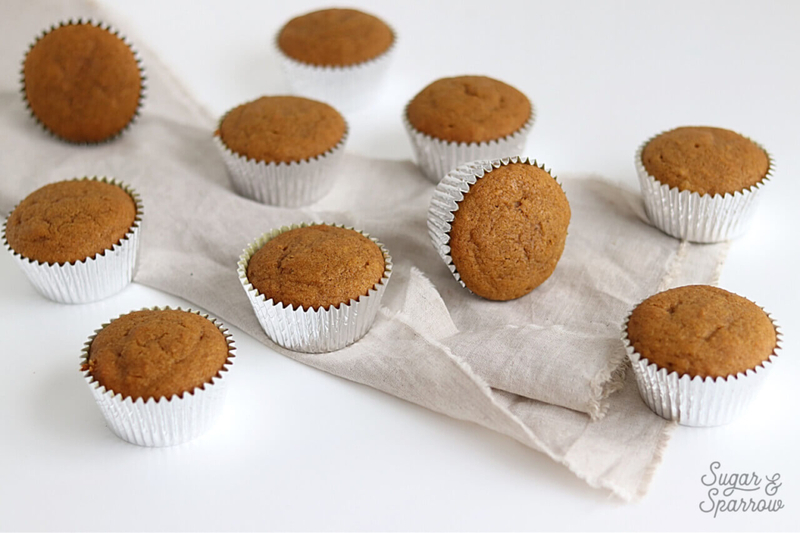 This cupcake recipe is a Fall staple in my book, and I hope it makes its way into yours. Whether you decorate them for Halloween, make them for another occasion, or hoard them all to yourself (like I do! ), they’re guaranteed to please. Happy Fall, y’all!